Campaigners against cluster munitions say Thailand has admitted it used the weapons against Cambodia in February. The Cluster Munition Coalition called the decision "appalling" and "unconscionable". The weapons were banned by an international convention three years ago, but neither Thailand nor Cambodia have signed the agreement. Admitting the use of cluster munitions would represent a significant shift in Thailand's position. 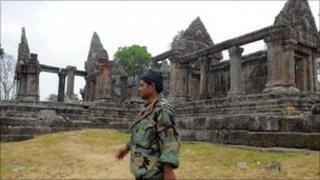 Cambodia was quick to accuse its larger neighbour of using the weapons during four days of border fighting in February. Thailand denied the allegation - saying that if anyone had used cluster munitions, it was Cambodian forces. But several humanitarian organisations have visited the border area around Preah Vihear temple, and they reported finding unexploded cluster bomblets. This evidence appears to have caused the shift in Bangkok's stance. The Cluster Munition Coalition says that Thailand has confirmed that it fired the weapons, claiming that it was self defence against heavy artillery from Cambodia landing in civilian areas. The coalition says that should not be a justification for using weapons which are banned by more than 100 countries. According to the campaigners, thousands of villagers are now at risk of death or serious injury because of unexploded ordnance near their homes. Part of the reason for the weapons notoriety is that children find the brightly-coloured bomblets attractive and get badly hurt if they pick them up.